On March 21, I took the audience at the San Francisco Flower and Garden Show on a gastronomical tour of Peru + Pisco during my first ever appearance at a Chef’s Stage. Though I’ve performed on stage before, it was not as a chef, but as a guest musician playing percussion with a Flamenco group from Spain at the Mountain View Center for the Performing Arts. This time, instead of playing my hand drums, however, I would be performing solo, sautéing and simmering on a stove top, and mixing cocktails on a side table. In other words, almost the same thing, right? So how did I end up on the stage this time? It all started with an invitation from the Chef’s Stage Coordinator, Jay Estey. Jay had contacted Olivia Maki, the former Program Coordinator at 18 Reasons, to ask her if she knew anyone that would be interested in appearing on the Chef’s Stage. Olivia mentioned me, and how I had cooked sold-out Peruvian pop-up dinners at 18 Reasons since August of 2011. Soon after that, Jay sent me an invitation to chat about appearing at the San Francisco Flower and Garden Show. Naturally, I jumped at the opportunity to represent Peruvian cuisine, and we started making plans for the event. After one coffee, one Peruvian pop-up dinner at 18 Reasons, and one Pisco pop-up at Omnivore Books, we had a plan: I was going to cook Aji de Gallina and make the legendary Pisco Punch. After weeks of preparation and planning, the actual event felt very smooth and relaxed. For almost an hour, I talked about the evolution of Peruvian cuisine as a 500 year fusion of Inca, Spanish, African, Chinese, and Japanese cultures. On a map projected on a screen, I showed how grapes were brought to Peru from Spain, and how Pisco, the oldest distilled spirit in the Americas, arrived in San Francisco from Peru during the 1849 Gold Rush. 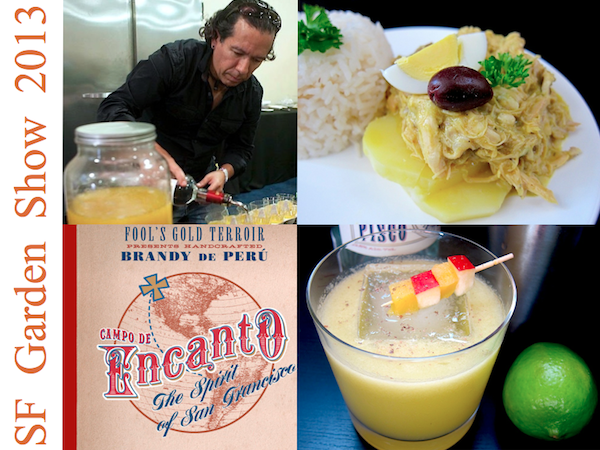 While my live cooking demo was being projected on a second screen, I answered questions from the audience, and at the end of the tour, I was delighted that everyone lined up for a bite of the Aji de Gallina and a taste of the Pisco Punch. 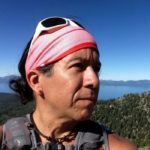 A few days after the event, I was very proud to see a post on Pisco Trail’s Facebook page from someone who attended my presentation. They enjoyed the demo, were inspired to cook their first ever Peruvian dish using my recipe for Aji de Gallina, and they loved it — mission accomplished. They were also thankful to have learned something new and in return I was deeply grateful to Olivia for spreading the word about Pisco Trail and to Jay for giving me the opportunity to share Peruvian food and culture with the audience at the Chef’s Stage. If it weren’t for them, I would only have one stage appearance, as a musician. Now, I have one as a chef, and I am ready to do it again. Thank you also to Campo de Encanto Pisco for providing their Pisco for the Pisco Punch !Gracias!